I first corresponded with Bob Dunsire in the late 1990s, though I can't remember the exact date. It was back in the days of the Internet Usenet newsgroup, rec.music.makers.bagpipe (RMMB). At the time, I was still a relatively inexperienced piper with a fairly new reference website hosted on a university's alumni server. Bob had his very sucessful Bagpipe Web Directory on his AOL account which included a few links to articles on my site. By 2001, RMMB was deteriorating rapidly due to a few individuals contributing very frequent negative, vulgar, and argumentative messages. Bob saw the need for a friendly easy-to-use online discussion environment and created a bagpiping forum in November of that year, hosted at BobDunsire.com—he said he wanted a domain name that was "neutral." Little did he know just how successful this new endeavour would be! The forums grew and grew and grew. He added moderators as time went on and I joined the moderator team in November 2003. 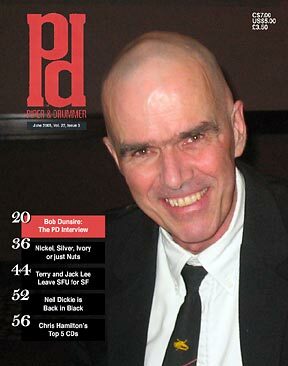 And here's the associated April 1st "Bob D. on the cover of P&D!" thread at BobDunsire.com. Bob had a good laugh and a few folks fell for the joke—some went so far as to argue at their band practice that Terry and Jack Lee were leaving SFU!—but this got me thinking. Maybe I could be a catalyst for a real interview with Bob in a magazine. I contacted EUSPBA's The Voice magazine and they were very interested. I broached the subject with Bob, but being humble, he was very hesitant. It took some pestering from me and a promise that he could pull the plug on the project at any point to get him going. I had also consulted Jack Lee who concurred that Bob really should get some credit for his work and I passed that opinion along to Bob. The interview was conducted via e-mail over the span of a couple of months with both of us doing some tweaking and revising. Bob approved. The lead-in paragraphs for the interview were written by me and edited by the magazine staff. We didn't make the cover, but it did see print. At the time of this writing, Bob Dunsire passed away yesterday, November 6, 2006 at the young age of 53. Bob was a great asset to the global bagpiping community and will be sincerely missedfor his humor, fairness, and selflessness. This page is dedicated to his memory . . . and his legacy. This page last updated Sunday, March 14, 2010, fixed thread link after a forum software change. Page first created in Tuesday, November 7, 2006.